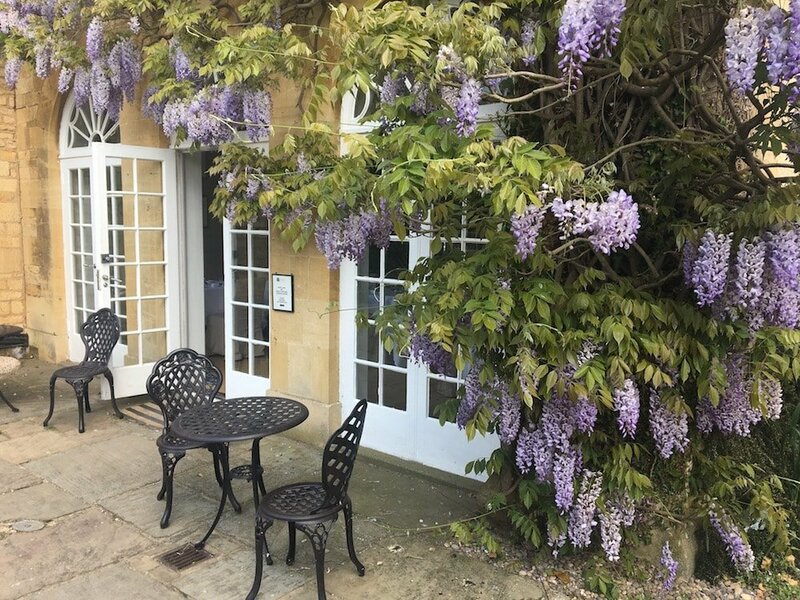 There are a fair few big-hitter country house hotels in our parts, so this discreet beauty hanging out on Chipping Campden’s picturesque high street probably isn’t on everyone’s radar when they’re thinking cheeky Cotswold overnighter. But it should be! 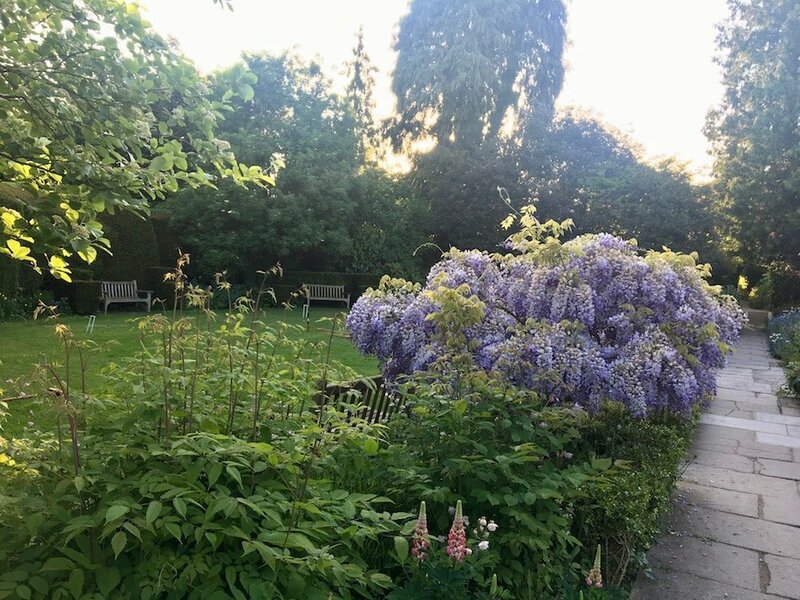 Deceptively large behind its honey-stone, 18th-century portico, it offers the full monty with dreamy rooms, fine-dining heaven, the prettiest garden and a full-on spa dispensing TLC on tap. 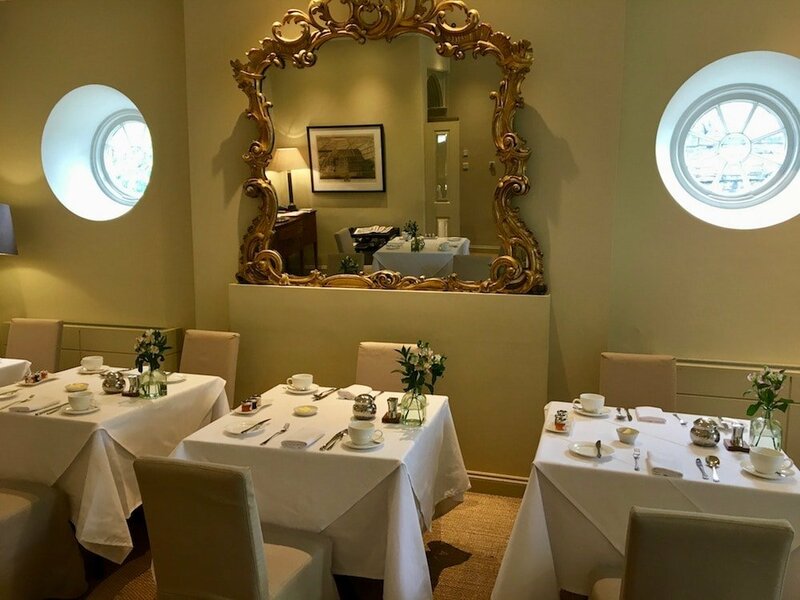 The hotel seduces you with the kind of refined elegance that makes you feel like you’re in a Jane Austen novel – I rather fancied I might bump into Elizabeth Bennett, Emma Woodhouse or the Dashwood sisters at any moment. 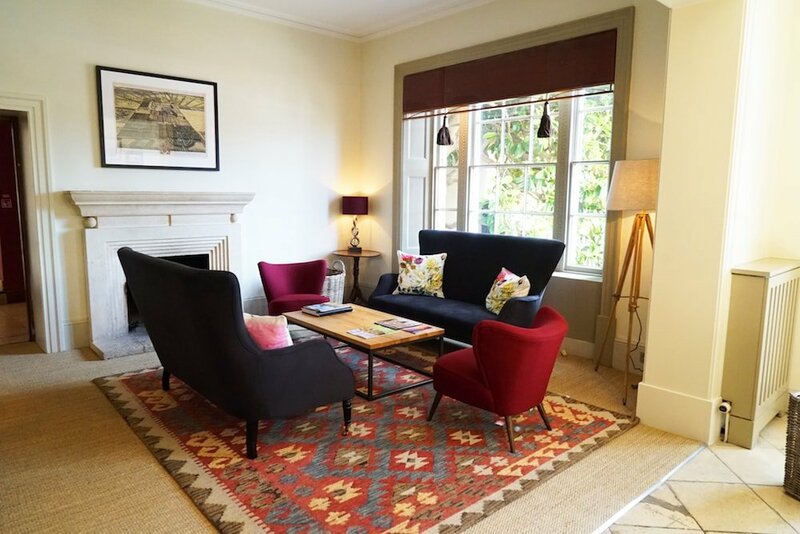 It’s had an extensive refurb of late and is all soothing Farrow & Ball tones, interesting artwork and elegantly plush furniture. It’s also incredibly relaxed despite its grand demeanour. This isn’t a hotel where you’re made to feel you need to watch your p’s and q’s; instead, you’re welcomed as if it’s your second abode and invited to make yourself at home, which I was more than happy to do. 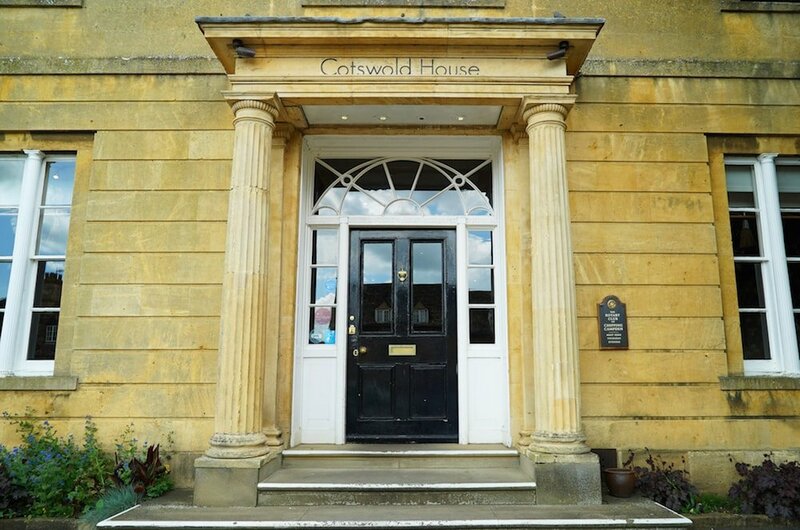 There are 22 rooms in the main building, all chichi and comfy in equal measure, plus six, dog-friendly, ‘cottage-style’ rooms in the garden. I had a canine friend in tow so was assigned a cottage room which came with its own private garden and hot tub!! 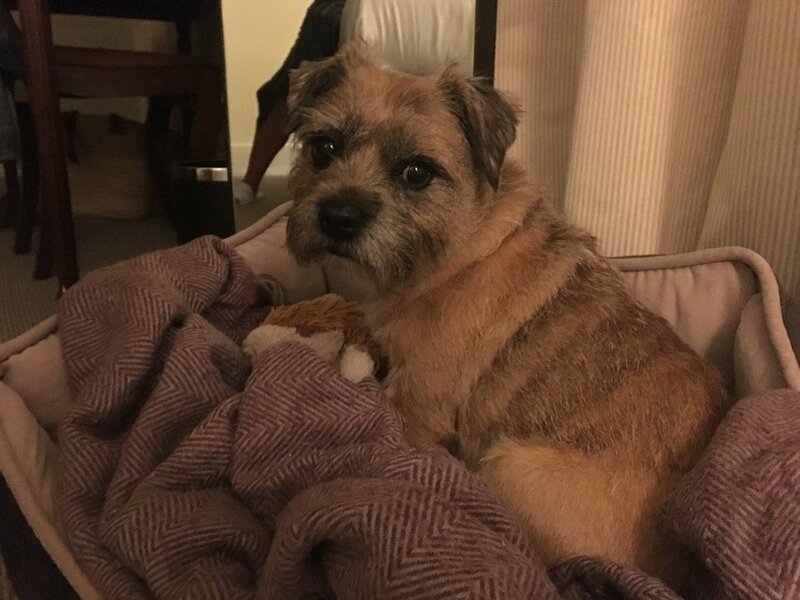 In I jumped – Betty the border terrier wasn’t quite so keen, but if Mr M had been there, well, what splashtastic fun we’d have had. The room was spacious – a bed, table and chairs, and desk didn’t feel squashed in – with an open fire which, come winter, would be just the ticket. The bathroom down a little corridor was nice and roomy too, with a bath and walk-in shower. Breakfast was definitely worth tearing myself away from the room’s delights for. 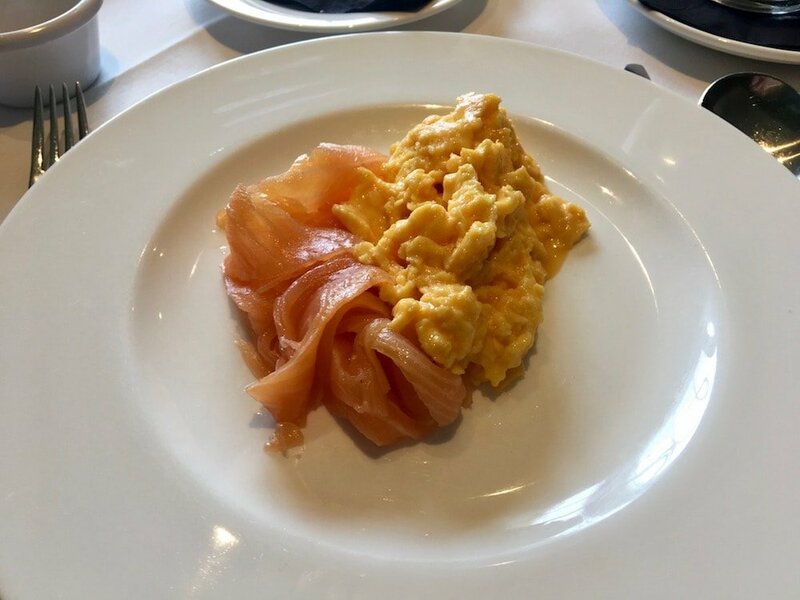 I attacked a plateful of creamy scrambled eggs and smoked salmon, and before I could say decaf soya latte, my charming waiter from the night before, who’d raised an amused eyebrow at my Californian-style, post-prandial, was presenting me with one. 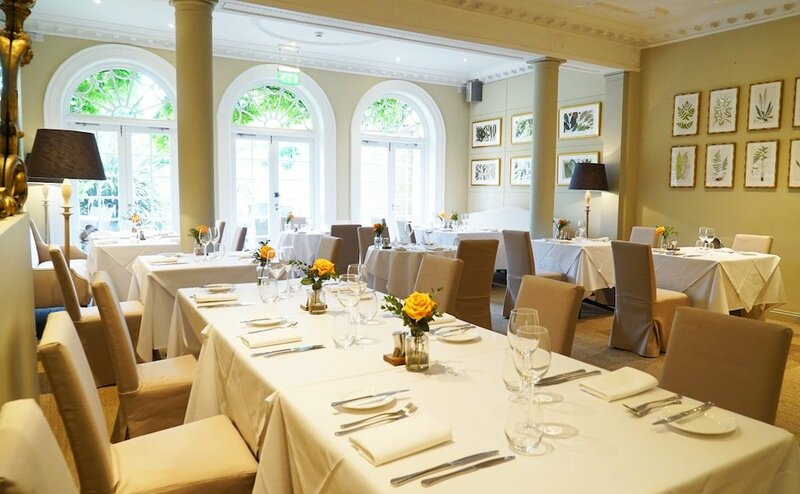 There are a couple of dining options – Bistro on the Square, a casual eatery with pub-style interiors and the Fig restaurant, a gorgeously fancy fine-dining venue with arched French doors (dripping with wisteria on my visit in May), Doric columns, a baroque overmantel mirror and chairs wearing a lovely shade of creamy yellow. Italian chef Pasquale Russo presides over the kitchen and his two AA rosettes are well deserved. The food is immaculate. In fact, I reckon Mr Michelin needs to book in because what I ate was definitely star-rated. We started with an amuse bouche of burrata with red pepper sauce – yum! 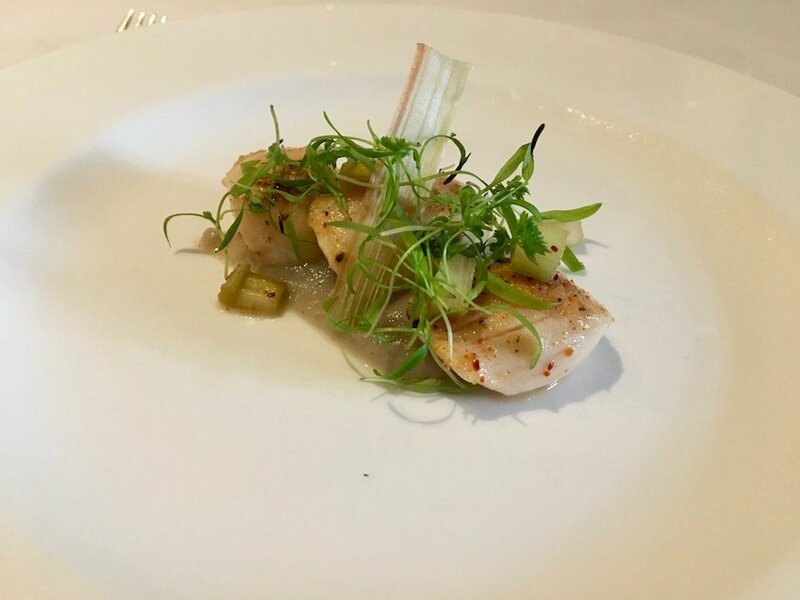 – swiftly followed by a starter of sautéed scallops with artichoke purée, poached rhubarb and chervil. Equally yum! And then it was the main event. Betty’s mummy opted for the halibut with potatoes and saffron, herb and tomato salsa, which I pinched a bit of and it was exquisite. 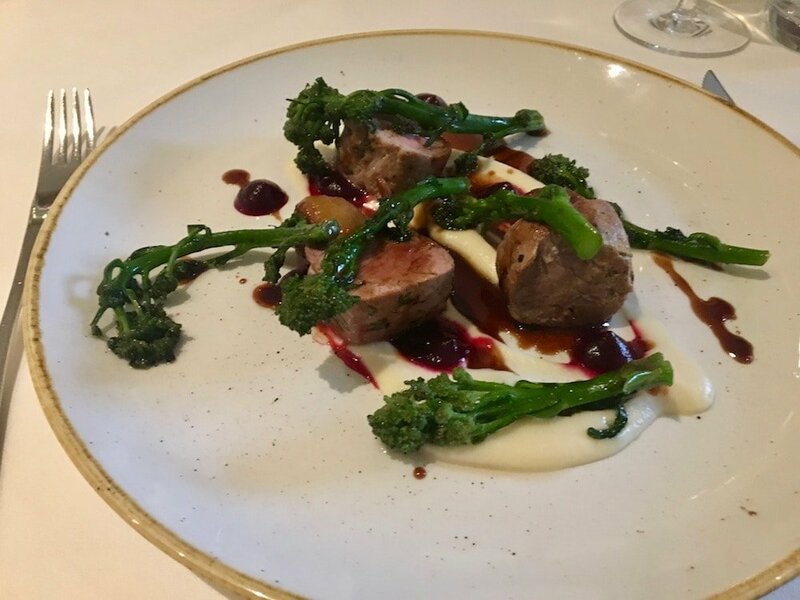 No need to feel jealous though, as my pork tenderloin with celeriac purée, golden beetroot and sprouting broccoli was to die for. I’m new to golden beetroot and along with the celeriac and broccoli it complemented the tender little pork morsels perfectly. And it looked a healthy plateful too, hurrah! Pudding (preceded by a pre dessert of lemon syllabub with lime jelly – I think I need to make pre desserts part of my life) was probably more naughty – but very nice. My milk and dark chocolate mousse with raspberry gel and ice cream was a melt-in-the-mouth affair that almost looked too pretty to eat. But somehow I managed to devour it without too much regard for aesthetics. 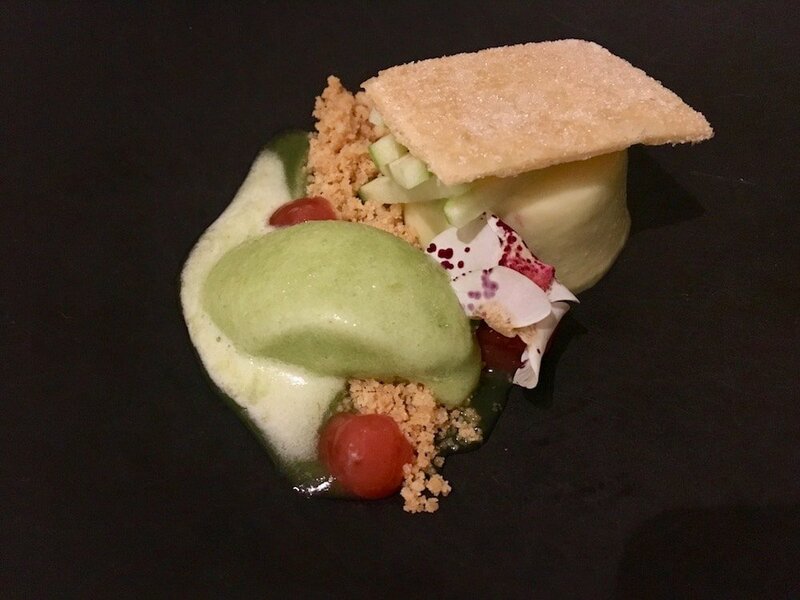 My friend’s green apple pannacotta looked pretty special too with its caramelised pastry, blood orange and Granny Smith sorbet. What I really liked about the food was how it took seasonal, local produce and turned it into something extraordinary without any culinary theatrics. A bit like the hotel as a whole – quietly brilliant. 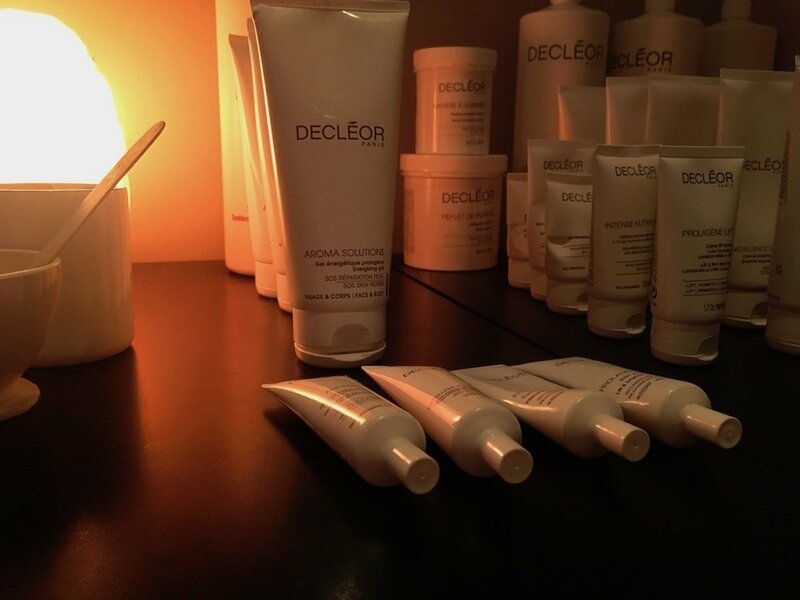 Small but perfectly formed, the spa at the hotel is run by the all-knowing Suzanne who booked me in for an Ultimate Vitamin Glow facial that destressed me and ironed out some wrinkles along the way with a host of heavenly Decléor products. 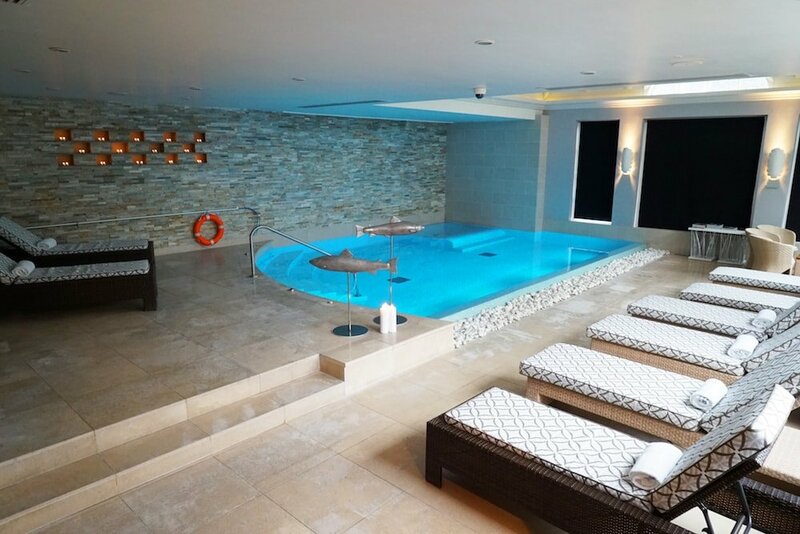 There are seven treatment rooms and a hydrotherapy pool, and I recommend putting yourself in the hands of Suzanne, who is an intuitive sort and will know just what TLC you need. 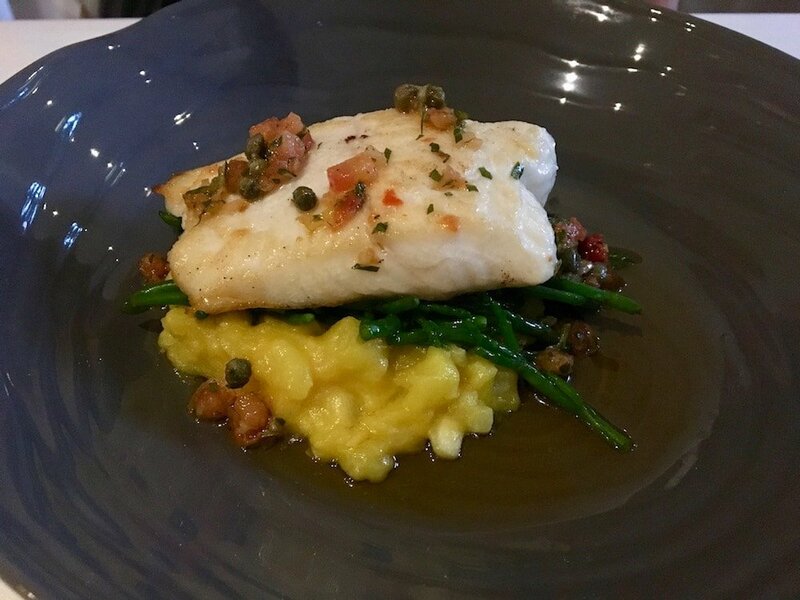 I would wince at taking a toddler into Fig restaurant and the spa is interdit to under 18s, but the rooms aren’t so luxe that you couldn’t risk a couple of children in them and the Bistro on the Square is the perfect spot for a family meal. It’s not a hotel looking to entertain kids, but they’re certainly not greeted with dropped jaws. And doggy companions are, of course, most welcome (although not in Fig for obvious reasons!). Chipping Campden is your quintessential Cotswold market town and has the boutiques to prove it. 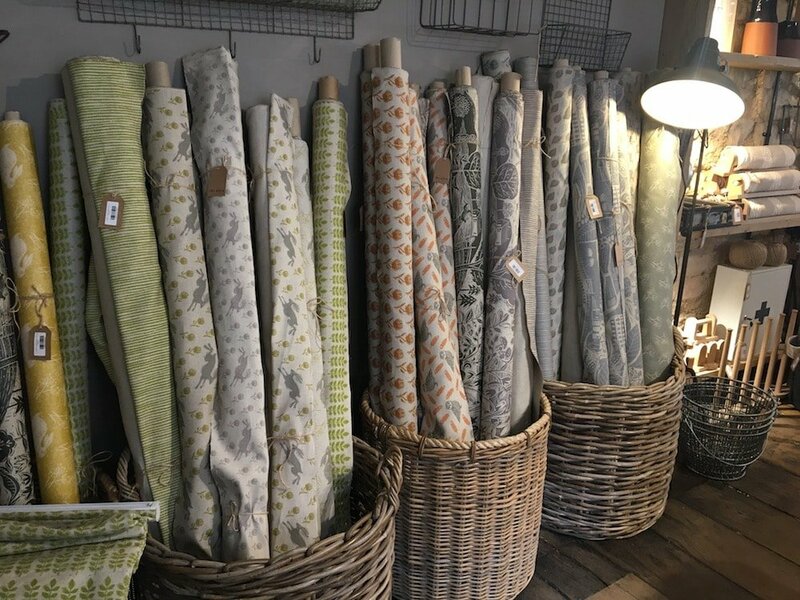 I was particularly taken with interiors store Sam Wilson which is brimming with original designs inspired by the British countryside adorning textiles, china and accessories. 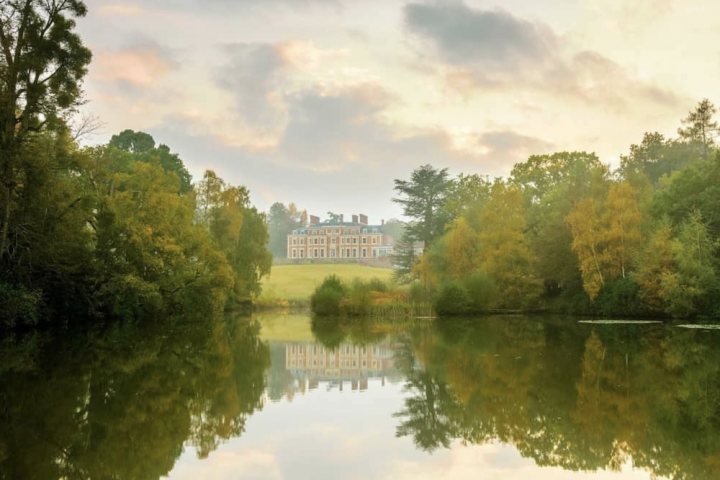 Once you’ve finished shopping, you’re in day-tripper paradise with Hidcote Manor Garden, Batsford Arboretum and Sezincote all around a quarter of an hour away. There are also lots of beautiful walks in the area if you fancy a ramble. Good for: Couples seeking a discreet hideway that isn’t in the middle of nowhere, ie, you can walk to some pubs, shops, a Post Office. Food enthusiasts looking for a fine-dining menu to get their teeth into. 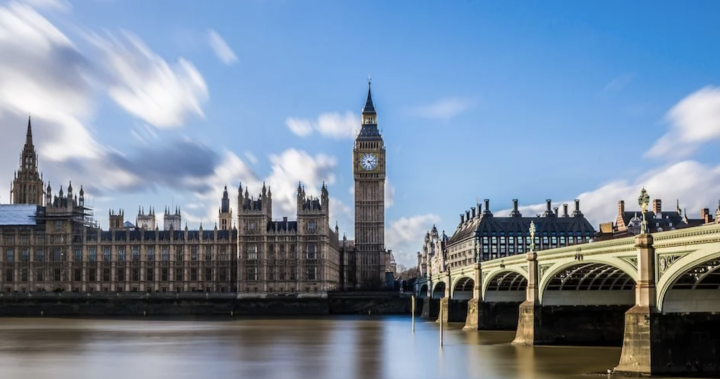 Stressed-out city souls allergic to deep countryside but wanting a Cotswolds recharge. Not for: If I had my three kids in tow, I wouldn’t put the hotel top of my wish list. 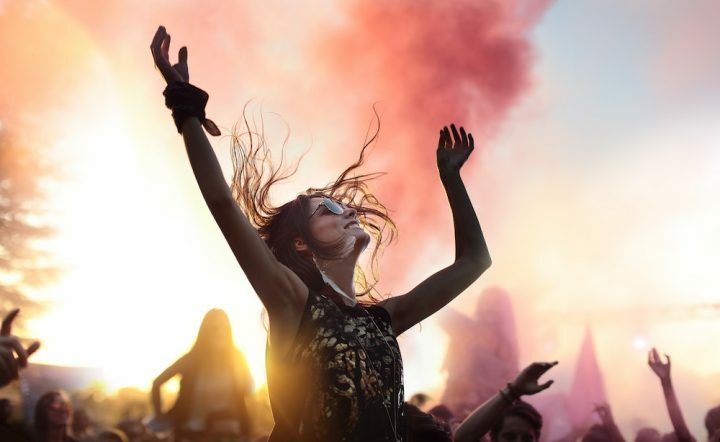 I think it’s definitely more suited to romantic trysts or a besties gathering that isn’t expecting turbo-charged fun. 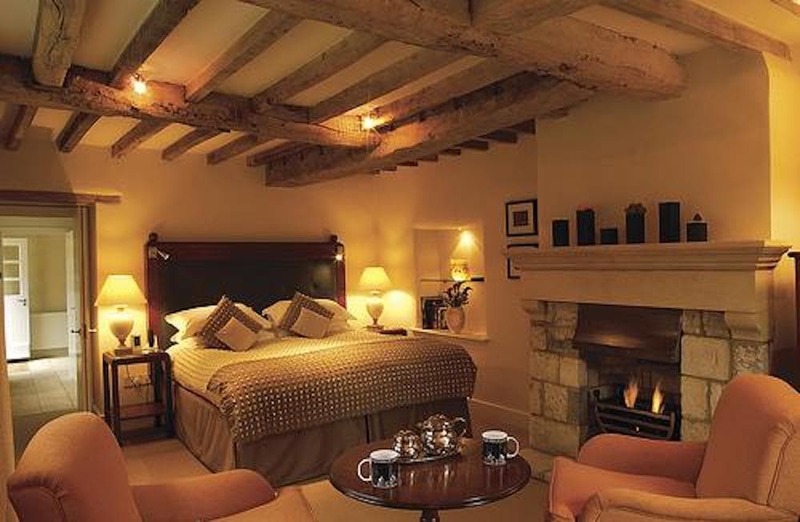 The damage: At a starting price of £150 for bed and breakfast, I’d say this is great value for money. And the prices in the restaurant won’t make you blanche either. 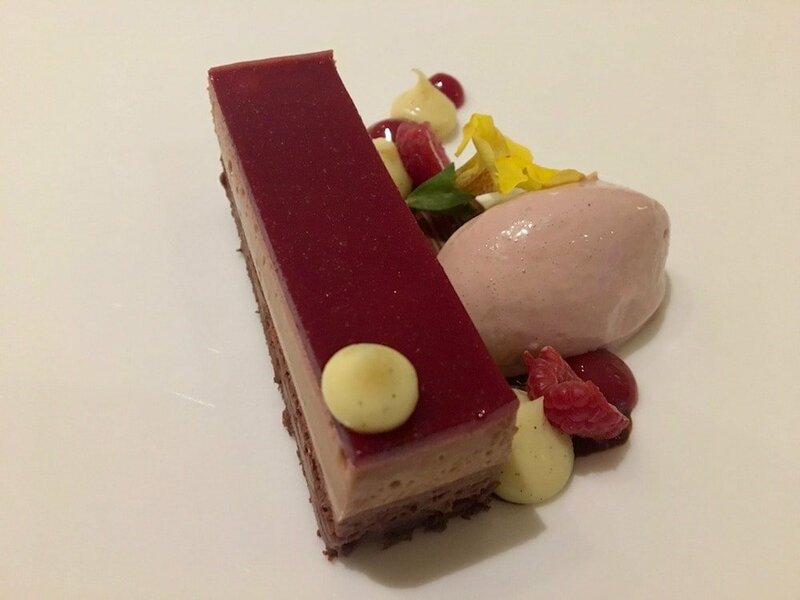 For the quality of the food, you’d expect to pay a lot more – a nine-course tasting menu is only £65. And there are very good wines for under £30 on the menu so you won’t break the bank on booze either.